I made this BMW cake for my friend who wanted a BMW car so badly. Instead of the real car I gave him the gift of car cake to motivate him to work even harder to buy the vehicle of his dreams. I made the cake with rainbow sponge cake and carved the cake based on a picture of a real BMW car that I found on the Internet and printed out. I printed it in a larger size to match the size of the cake pan I have. I also printed out a pic of the the side of the car and the back and front. When I carved the side of the cake I stuck the side view picture of the car against the cake. I did the same for the back and front of the car. Once I was sure I had carved the cake well enough and it looked the way I wanted it to, I covered it with buttercream and fondant. Then, I let the it sit for a day. 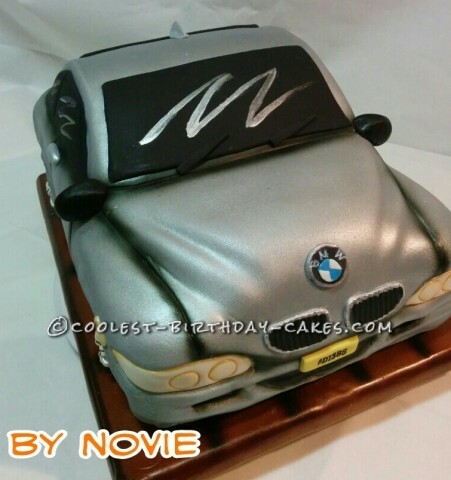 The next day I airbrushed the BMW cake as I envisioned it to be and let it sit for couple hours to let the edible airbrush paint dry. Then, I made the headlights and tail lights, and everything else that was remaining to be done. The final result is cool and sporty… perfect for anyone who loves BMWs!